It’s successes like these that get Smith up in the morning and energize her for her work as a shelter veterinarian. As a student at the Cummings School, working in a shelter wasn’t part of her career plan, because until recently, most U.S. veterinary schools did not include shelter medicine among their menu of curricula. That has changed as the notion of shelter animals as throwaways is no longer accepted. Animal welfare organizations and the public are demanding medical care and permanent homes, not euthanasia, from the shelters that harbor lost, homeless or unwanted animals. And as the practice of euthanizing healthy animals as a way to control population has become increasingly unacceptable, shelters have found themselves struggling with caring for burgeoning numbers of pets, rising costs and the complex medical challenges of managing animals with unknown or incomplete medical histories. Although there is no national clearinghouse for data on animal shelters, the Humane Society of the United States estimates that shelters care for between 5 and 7 million dogs and cats every year; approximately 3 to 4 million of them are euthanized. Another 2 to 3 million are placed in permanent homes. And while 63 percent of American households have pets, only about 16 percent of those households adopt from shelters, according to the American Pet Products Manufacturing Association. Keeping these shelter animals healthy (they’re at higher risk for infectious diseases and may pose a threat to public health through rabies and other diseases transmitted from animals to humans), and training veterinarians to care for them and pre pare them for adoption, have become urgent needs. Enter shelter medicine. The Association of Shelter Veterinarians (www.sheltervet.org), founded in 2003, now has some 600 members and a dozen student chapters— including one at the Cummings School. The association is pursuing board-specialty status for the field. Programs in shelter medicine are offered at a number of U.S. veterinary schools, and the Humane Society of the United States publishes the bimonthly Animal Sheltering magazine. At the Cummings School, veterinarians in the Center for Animals and Public Policy and the department of clinical sciences are partnering with the Animal Rescue League of Boston and the Massachusetts Society for the Prevention of Cruelty to Animals to design and establish a shelter medicine training program at Tufts. The goal is to offer a certificate in shelter medicine. Like many of the programs that have successfully launched at the Cummings School, the impetus for the shelter medicine program began with the students. At least half of the students applying for admission write about their interest in animal sheltering. 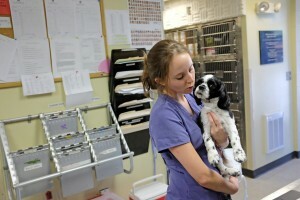 Many have obtained animal-care experience through volunteering or working at an animal shelter. Three years ago, Annette Rauch, V86, G01, who is interim director of Tufts’ nascent shelter medicine program, supported a group of Cummings students in their desire to launch the Tufts Shelter Medicine Club, now among the most active student groups on campus. The club sponsors educational seminars, takes groups of students on field trips to shelters and holds a yearly drive to provide food, toys, blankets and other supplies to local shelters. And just last spring, the club sponsored a free vaccination clinic for pet owners in the Worcester area. 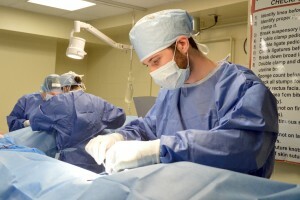 In their exit interviews before they graduate from the Cummings School, students often express their desire for more surgical training and for more exposure to shelter medicine. The shelter medicine program will address both issues by establishing new courses and surgical and shelter rotation electives. This fall, in a first step toward full implementation of the program, students had the opportunity to perform additional surgeries on shelter animals in the school’s Luke & Lily Lerner Spay/Neuter Clinic, under the supervision of Susan L. Mitchell, V91, an assistant professor of clinical sciences. “The spay clinic has the dual mission of serving the local animal shelter community—which means doing up to 30 surgeries a week—and teaching our students,” says Emily McCobb, V00, G03, an anesthesiologist at Tufts’ Veterinary Emergency Treatment & Specialties (VETS) in Walpole, Mass., who served on the working group to develop the shelter medicine program. Contributions from Cummings School overseers V. Duncan and Diana L. Johnson, who’ve adopted many of their pets from shelters, the Kenneth A. Scott Charitable Trust, the Trimix Foundation and the Massachusetts Animal Coalition have helped support the program. “When shelters were started 150 years ago, many people looked at the animals in them as unnecessary, as unwanted throwaway animals, and they were just put to sleep,” Rauch says. “We have evolved to have a more compassionate outlook. Now we believe it’s a worthy enterprise to keep these animals. Training veterinary students to recognize the special needs of shelter animals, and how to diagnose and treat them, is critically important to addressing long-term solutions for this vulnerable population of animals, Rauch says. Because the typical patients Cummings students see during their in-hospital training have devoted owners and are well cared for, they are not exposed to the range of problems that can afflict animals that have not had regular preventive care, or have been abused or neglected. The new shelter medicine program—including rotations at the busy Boston shelters affiliated with it—will provide experiences students may otherwise not get during their traditional D.V.M. studies. The Cummings School is ideally situated to offer a concentration in shelter medicine, says McCobb of Tufts VETS. “We are lucky that New England is such a nexus of animal welfare. We have leaders in our state at the MSPCA, the Animal Rescue League of Boston, as well as the Massachusetts Animal Coalition—and there are many other small rescue organizations and animal welfare organizations here. As a region, we are considered progressive and animal-welfare-oriented. So the resources for our students are great,” she says. Two of those advocates graduated from the Cummings School more than a decade ago, before shelter medicine had found its way. 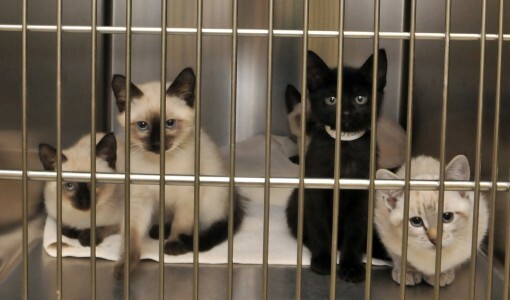 Inevitably, an important component of shelter medicine is animal cruelty investigation. “Shelter veterinarians are playing a growing role in the forensic investigation of animal cruelty,” says Smith, who works closely with law enforcement in Boston. Shelter medicine is advancing on all fronts, Smith says—the medical, the surgical and the behavioral—in response to pressure from society to rescue and rehabilitate, rather than dispose of unwanted animals. A lot of what shelter medicine focuses on is assessing animals’ needs and figuring out how to make them adoptable. This story, written by Catherine O’Neill Grace, originally appeared in the Winter 2008 Tufts Veterinary Medicine magazine.